Gloucester overcame the first-half sending off of Matt Kvesic to record a three-try win over London Irish. Flanker Kvesic was shown a red card on 23 minutes after a dangerous tackle on Tomas O'Leary to leave the hosts at a serious disadvantage. A try from Alex Lewington put Irish ahead, but the hosts came roaring back. 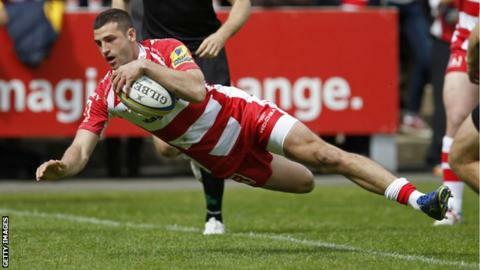 Tries from England wing Jonny May, Dan Thomas and Henry Purdy defied the visitors' numerical advantage to secure victory for Gloucester. Earlier the visitors had nearly taken the lead from the start with Andy Fenby breaking from Gloucester's kick off, but Blair Cowen was adjudged to have knocked on as he grounded the ball. Irish continued their pressure but again could not put points on the scoreboard when Fenby's effort was ruled out by the television match official. Gloucester weathered the storm and Greg Laidlaw added a penalty before Kvesic left the field for a tackle that left O'Leary unable to continue. Lewington took advantage shortly after, benefitting from Shane Geraghty's break to cross the line. The hosts refused to give in and Billy Burns' chip was collected by May for a try shortly after. With a further penalty from Laidlaw, the 14-man hosts led 13-5 at half-time and pushed on in the second period. Laidlaw himself contributed 15 points from the boot. Thomas finished off a driving maul and Purdy raced through to turn Callum Braley's kick into a third try before replacement Andy Short scored a consolation try for the visitors. The result leaves Gloucester ninth and London Irish 10th in the Premiership table. "It was a difficult game as the first 20 minutes were funny being stuck in our 22. The character of the side then shone through as we refused to give up easy points. "We had a strong wind in our favour in the second half so we dug in and took our opportunities when they arrived." On the sending-off of influential flanker Kvesic: "Matt is very disappointed and is very apologetic to the group. He was a little bit unfortunate but it was an automatic red card under the letter of the law. "There were mitigating circumstances as there was no intent. We will go home and have a look at it but a ban is a likelihood bearing in mind World Rugby's stance on this matter." "We weren't accurate enough and the penalties kept coming against us, which left us with a mountain to climb. "After a bright start when we didn't make hay with the chances we had, the red card was a momentum-changer as they played brilliantly in a broken play scenario." Gloucester: Sharples, May, Macken, Twelvetrees, Purdy, Burns, Laidlaw, Y. Thomas, Hibbard, Puafisi, Savage, Galarza, D. Thomas, Kvesic, G. Evans. Replacements: Hook for Burns (25), Dawidiuk for Hibbard (25). London Irish: Fenby, Lewington, Griffin, Geraghty, J. Short, Noakes, O'Leary, Court, Paice, Palframan, Skivington, Sinclair, Narraway, Cowan, Guest. Replacements: Sheridan for O'Leary (25). Sin bin: Sheridan (34), Leo (69).